Epsilonproteobacteria are a class of Proteobacteria. All species of this class are, like all Proteobacteria, Gram-negative. The Epsilonproteobacteria consist of few known genera, mainly the curved to spirilloid Wolinella spp., Helicobacter spp., and Campylobacter spp. Most of the known species inhabit the digestive tracts of animals and serve as symbionts (Wolinella spp. in cattle) or pathogens (Helicobacter spp. in the stomach, Campylobacter spp. in the duodenum). The genus Wolinella is a member of the Campylobacterales order of Bacteria. 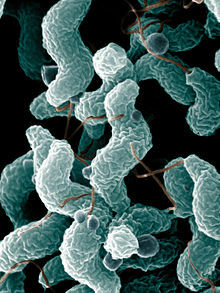 The order Campylobacterales includes human pathogens such as Helicobacter pylori and Campylobacter jejuni. A cold seep is an area of the ocean floor where hydrogen sulfide, methane and other hydrocarbon-rich fluid seepage occurs, often in the form of a brine pool. Cold does not mean that the temperature of the seepage is lower than that of the surrounding sea water. On the contrary, its temperature is often slightly higher. The "cold" is relative to the very warm conditions of a hydrothermal vent. Cold seeps constitute a biome supporting several endemic species. Sulfurimonas is a bacterial genus within the class of Epsilonproteobacteria, known for reducing nitrate, oxidizing both sulfur and hydrogen, and containing Group IV hydrogenases. This genus consists of four species: Sulfurimonas autorophica, Sulfurimonas denitrificans, Sulfurimonas gotlandica, and Sulfurimonas paralvinellae. The genus' name is derived from "sulfur" in Latin and "monas" from Greek, together meaning a “sulfur-oxidizing rod”. The size of the bacteria varies between about 1.5-2.5 μm in length and 0.5-1.0 μm in width. Members of the genus Sulfurimonas are found in a variety of different environments which include deep sea-vents, marine sediments, and terrestrial habitats. Their ability to survive in extreme conditions is attributed to multiple copies of one enzyme. Phylogenetic analysis suggests that members of the genus Sulfurimonas have limited dispersal ability and its speciation was affected by geographical isolation rather than hydrothermal composition. Deep ocean currents affect the dispersal of Sulfurimonas spp., influencing its' speciation. As shown in the MLSA report of deep-sea hydrothermal vents Epsilonproteobacteria, Sulfurimonas has a higher dispersal capability compared with deep sea hydrothermal vent thermophiles, indicating allopatric speciation. The Mesoproterozoic Era is a geologic era that occurred from 1,600 to 1,000 million years ago. The Mesoproterozoic was the first period of Earth's history of which a fairly definitive geological record survives. Continents existed during the preceding era, but little is known about them. The continental masses of the Mesoproterozoic were more or less the same ones that exist today. Halopiger is a genus of archaeans in the family Halobacteriaceae that have high tolerance to salinity. Nautilia profundicola is a Gram-negative chemolithoautotrophic epsilonproteobacterium found around hydrothermal vents in the deep ocean. It was first discovered in 1999 on the East Pacific Rise at depth of 2,500 metres (8,200 ft), on the surface of the polychaete worm Alvinella pompejana. Nautilia profundicola lives symbiotically on the dorsal hairs of A. pompejana but they may also form biofilms and live independently on the walls of hydrothermal vents. The ability of N. profundicola to survive in an anaerobic environment rich in sulfur, H2 and CO2 of varying temperature makes it a useful organism to study, as these are the conditions that are theorized to have prevailed around the time of the earliest life on earth. Sulfurovum is a genus within the Epsilonproteobacteria which was first described in 2004 with the isolation and description of the type species Sulfurovum lithotrophicum from Okinawa trough hydrothermal sediments. Named for their ability to oxidize sulfur and their egg-like shape, cells are gram-negative, coccoid to short rods. Mesophilic chemolithoautotrophic growth occurs by oxidation of sulfur compounds coupled to the reduction of nitrate or molecular oxygen. 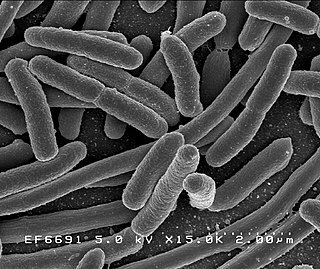 Sulfurovum lithotrophicum is a species of bacteria, the type species of its genus. It is a sulfur-oxidizing chemolithoautotroph within the ε-Proteobacteria isolated from Okinawa Trough hydrothermal sediments. It is mesophilic and also oxidises thiosulfate. It is a Gram-negative, non-motile and coccoid to oval-shaped bacterium. The type strain is 42BKTT. Palaeococcus ferrophilus is a barophilic, hyperthermophilic archaeon from a deep-sea hydrothermal vent chimney. It cells are irregular cocci and motile with multiple polar flagella. Methylocella tundrae is a species of bacterium. It is notable for oxidising methane. Its cells are aerobic, Gram-negative, non-motile, dinitrogen-fixing rods. Strain T4T is the type strain. Sulfurimonas autotrophica is a sulfur- and thiosulfate-oxidizing ε-proteobacterium. It is mesophilic, and its cells are short rods, each being motile by means of a single polar flagellum. Its genome has been sequenced. Sulfurimonas paralvinellae is a hydrogen- and sulfur-oxidizing ε-proteobacterium. It is a mesophilic chemolithoautotroph. Persephonella guaymasensis is a thermophilic, hydrogen-oxidizing microaerophile first isolated from a deep-sea hydrothermal vent. It is strictly chemolithoautotrophic, microaerophilic, motile, 2-4 micrometres in size, rod-shaped, Gram-negative and non-sporulating. Its type strain is EX-H2T. Nautilia lithotrophica is a thermophilic sulfur-reducing epsilon-proteobacterium isolated from a deep-sea hydrothermal vent. It is strictly anaerobic, with type strain 525T. Caminibacter profundus is a species of moderately thermophilic, microaerobic to anaerobic, chemolithoautotrophic bacterium. It is a Gram-negative, non-motile rod, with type strain CRT. Deferribacter desulfuricans is a species of sulfur-, nitrate- and arsenate-reducing thermophile first isolated from a deep-sea hydrothermal vent. It is an anaerobic, heterotrophic thermophile with type strain SSM1T. Lebetimonas is a genus of bacteria from the family Nautiliaceae. Lebetimonas acidiphila is a thermophilic, acidophilic, hydrogen-oxidizing and motile bacterium from the genus of Lebetimonas. To observe growth there temperature should be between 30 to 68 degrees celsius. Nautilia abyssi is a thermophilic, sulfur-reducing and strictly anaerobic bacterium from the genus of Nautilia which has been isolated from a hydrothermal chimney from the East Pacific Rise. Nautilia nitratireducens is a Gram-negative thermophilic, chemosynthetic, anaerobic bacterium from the genus of Nautilia which has been isolated from a hydrothermal vent from the East Pacific Rise. ↑ "www.ncbi.nlm.nih.gov" . Retrieved 2009-03-19. ↑ Inagaki, F. (2003-11-01). "Sulfurimonas autotrophica gen. nov., sp. nov., a novel sulfur-oxidizing -proteobacterium isolated from hydrothermal sediments in the Mid-Okinawa Trough". International Journal of Systematic and Evolutionary Microbiology. 53 (6): 1801–1805. doi:10.1099/ijs.0.02682-0. ISSN 1466-5026. PMID 14657107 . Retrieved 2013-05-29. ↑ Takai, K. (2006-08-01). "Sulfurimonas paralvinellae sp. nov., a novel mesophilic, hydrogen- and sulfur-oxidizing chemolithoautotroph within the Epsilonproteobacteria isolated from a deep-sea hydrothermal vent polychaete nest, reclassification of Thiomicrospira denitrificans as Sulfurimonas denitrificans comb. nov. and emended description of the genus Sulfurimonas". International Journal of Systematic and Evolutionary Microbiology. 56 (8): 1725–1733. doi:10.1099/ijs.0.64255-0. ISSN 1466-5026. PMID 16901999 . Retrieved 2012-11-09. ↑ Inagaki, Fumio; Ken Takai; Kenneth H. Nealson; Koki Horikoshi (2004-09-01). "Sulfurovum lithotrophicum gen. nov., sp. nov., a novel sulfur-oxidizing chemolithoautotroph within the ε-Proteobacteria isolated from Okinawa Trough hydrothermal sediments". International Journal of Systematic and Evolutionary Microbiology. 54 (5): 1477–1482. doi:10.1099/ijs.0.03042-0. ISSN 1466-5026. PMID 15388698 . Retrieved 2013-06-27. ↑ Julie L. Smith; Barbara J. Campbell; Thomas E. Hanson; Chuanlun L. Zhang; S. Craig Cary (2008). "Nautilia profundicola sp. nov., a thermophilic, sulfur-reducing epsilonproteobacterium from deep-sea hydrothermal vents". International Journal of Systematic and Evolutionary Microbiology . 58 (7): 1598–1602. doi:10.1099/ijs.0.65435-0. PMID 18599701. ↑ Suzuki, Yohey; Sasaki, Takenori; Suzuki, Masae; Nogi, Yuichi; Miwa, Tetsuya; Takai, Ken; Nealson, Kenneth H.; Horikoshi, Koki (2005). "Novel Chemoautotrophic Endosymbiosis between a Member of the Epsilonproteobacteria and the Hydrothermal-Vent Gastropod Alviniconcha aff. hessleri (Gastropoda: Provannidae) from the Indian Ocean". Applied and Environmental Microbiology . 71 (9): 5440–5450. doi:10.1128/AEM.71.9.5440-5450.2005. PMC 1214688   . ↑ Takai, Ken; et al. (2005). "Enzymatic and genetic characterization of carbon and energy metabolisms by deep-sea hydrothermal chemolithoautotrophic isolates of Epsilonproteobacteria" (PDF). Applied and Environmental Microbiology. 71 (11): 7310–7320. doi:10.1128/aem.71.11.7310-7320.2005. PMC 1287660   . PMID 16269773. ↑ Campbell, Barbara J.; Annette Summers Engel; Megan L. Porter; Ken Takai (2006-05-02). "The versatile ε-proteobacteria: key players in sulphidic habitats". Nature Reviews Microbiology. 4 (6): 458–468. doi:10.1038/nrmicro1414. ISSN 1740-1526 . Retrieved 2012-11-09. ↑ Anbar, A. D.; A. H. Knoll (2002-08-16). "Proterozoic Ocean Chemistry and Evolution: A Bioinorganic Bridge?". Science. 297 (5584): 1137–1142. doi:10.1126/science.1069651. PMID 12183619 . Retrieved 2010-10-12. ↑ J.P. Euzéby. "Epsilonproteobacteria". List of Prokaryotic names with Standing in Nomenclature (LPSN). Archived from the original on 2011-10-07. Retrieved 2011-11-17. ↑ Sayers; et al. "Epsilonproteobacteria". National Center for Biotechnology Information (NCBI) taxonomy database. Retrieved 2011-06-05.